Libby's Little Addiction: April My Monthly Hero - Release + Giveaway! April My Monthly Hero - Release + Giveaway! Hello and welcome! It's kit release day over at Hero Arts, yippee!! I'm blog hopping with a fabulous list of artists, introducing you to this month's kit and add-on products. You should have found me by way of my sweet friend Heather's blog - if you didn't, start back at the very beginning with Hero Arts! I made several projects for the landing page over on the Hero Arts website, so I thought I'd share a closer look at those cards. I love the cute little ballerina dress in the kit, so I stamped it repeatedly and watercolored it pink. Next, this super fabulous silhouette. It's hard to see in the photo, but I went over her dress with Wink of Stella, so it shimmers. The gems compliment it well. 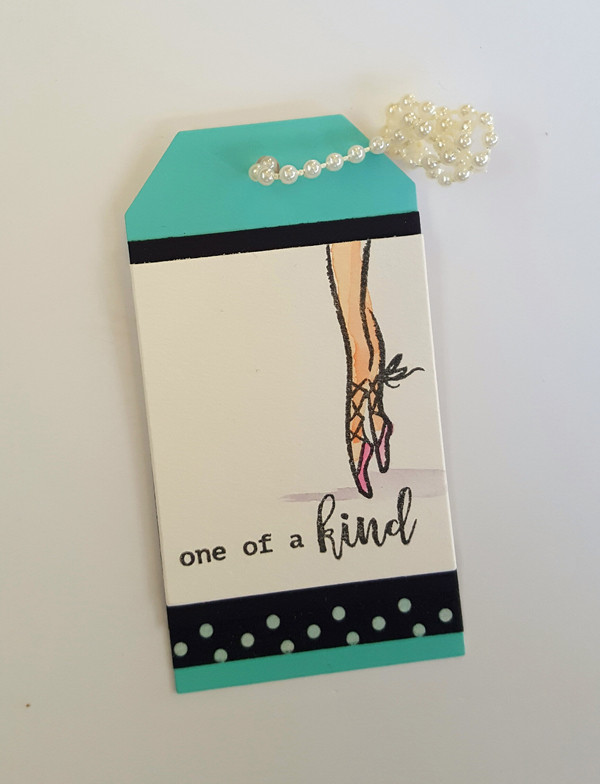 And finally, a fun little tag with the gorgeous ballet legs, again watercolored. I tied pearls at the top of the tag instead of ribbon or twine - those pearls come in the kit. Here's a look at the April My Monthly Hero kit, isn't it sweet?? And I'm part of an amazing blog hop today! Please visit all of the links below, and leave comments as you go! Hero Arts is giving away a kit to one lucky commenter, drawn from the comments left on all of the blogs. You have until Sunday, April 9 at 11:59pm to get your comments in. Check the Hero Arts blog for the winner! Now head on over and see what the super sweet and talented Michelle Short is sharing with us today. I am really loving this set... the ballerina dress is so so pretty. I can't wait to use that stamp! Your cards and tag are beautiful. Very chic! What an awesome kit. Beautiful cards! The "Audry Dress" is a must have! Cute, Cute just plain cute! I love your cards & tag! Very inspiring. Love, love, love the cards. Thank you for sharing. Can't wait to try this set myself. Great cards. Thanks for sharing. Beautiful work! Thanks for the inspiration!!! Lovely cards and tag. The colors of the card in this kit are incredible! Love all your projects but especially like the tag! Thank you for the chance to win! Not sure which of your projects I like the best. All of them are wonderful. I totally adore this kit. These are all so pretty! I imagine the 2nd one is even more elegant in real life with the shimmer. Beautiful cards. My favorite is the tutu!!! Lovely cards and tag! Love the ballerina feet stamp!! Your cards and tag are awesome and so is this new kit!! 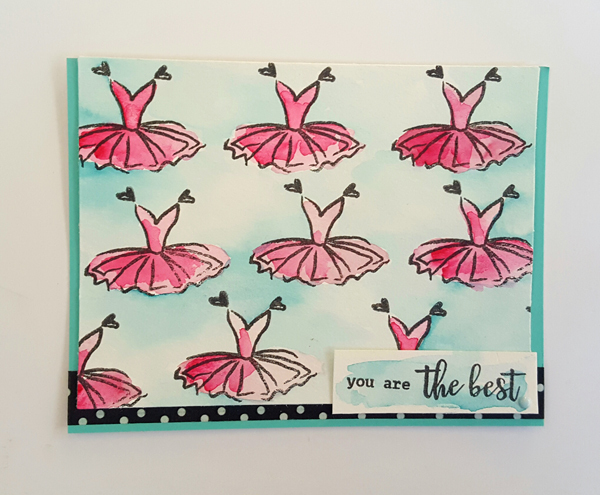 three wonderful inspiration cards from this kit Libby!! Great cards! i think the silhouette with the pink background is my favorite. Lovely cards Libby! This new release is so exciting and unique! I hope that Hero Arts has a lot of these kits! Thanks for sharing your inspiration and talents with us! They're beautiful cards especially the tutu one. What a great kit this month! I love the "chic" cards you've created with it. Gorgeous! These are all so fun - especially love the tag. Great new stuff this month. Thanks! All so cute and feminine!! Love the soft watercolors and how embellished each. They look so elegant, super cute! Love that tag--perfect way to tie it off!! 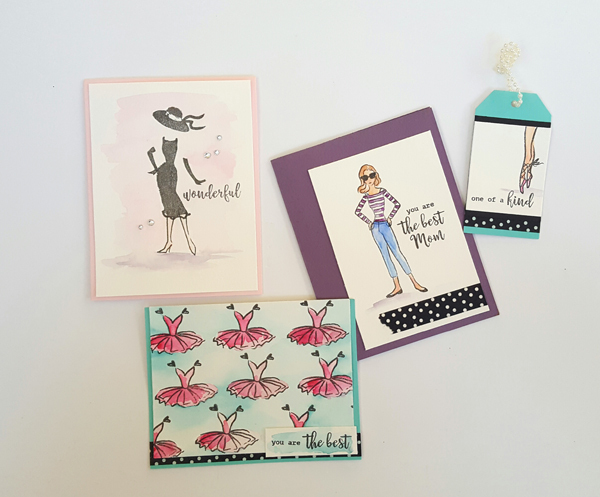 Elegant and classy cards and tag, love the dotty washi tape and soft watercolor background details. Great cards.I love the April My Monthly Hero kit. This is the best kit ever. Love your ideas. I love all your creations! Especially love the card with the pink tutu's. so gorgeous, Libby!! I love the use of the pearls on the tag and that tutu background is so lovely, especially with the blue. Hi Libby, lovely cards and tag! Love the soft colors and also, the dress card's pop of pink, very nicely done! Thanks for sharing! Love the retro look to your cards. I definitely want to try one with tutu's. so sweet! Everything is Fabulous! I love all your projects! The tutu card is so eye catching! So excited to get my kit! Thanks for sharing & wonderful job!!! Love all your cards! Can't wait to get this kit! Super cute! Love your ballerina tag! Can't wait to play with my kit! Your cards are super sweet! Love how you used one stamp for a background..I am totally copying that one! Thank you. Each of your cards turned out wonderfully! Fabulous projects, Libby!! LOVE that tag!! Beautiful creations!! I really LOVE your tag!! Love these cards and those beautiful watercolor looks! Plus love how you used the pearls in the kit on the tag! Wonderful inspiration. Love the tag. So fun! Thanks for sharing on this great blog hop!! Love the cards and tags. Beautiful colors as well. Oh I adore these cards!! So cool!!! These are so well done. . .I love your basic black stamping with the wash of watercolor. It looks deceptively simple --with great results. Thanks for sharing these. Fabulous variety...I loved your interpretations. I can't wait until I get my hands on this stamp set. Gorgeous cards. OMG! What awesome cards you made. Great job they are so adorable. Libby, ALL of your projects are fabulous! Oh my gosh! These cover the classy and the sassy! Such great images! You did such a great job with these! Love the tag and the new HA kit! Just in time for dance recital season. This kit is very versatile. I can't wait to use it, thanks for the inspiration. Love what you've done with it,can't wait to play! Such great projects Libby! I love the pearls on the tag. I think if I had this kit I would never get anything else done - too much fun and oh the possibilities!!! Great cards! That kit looks like so much fun! Thank you for the inspiration. Love your cards and can't wait to get this kit! Lovely projects. You played well with this kit. I can't wait to play with mine. Enjoyed your coloring on these great cards. Terrific and super fun projects! So many possibilities with this kit! What a great kit, and I love what you have made from it Libby - fabulous projects. Your cards are lovely; and I really like the one with all the ballet outfits. Very creative! You always create the most amazing art! Just beautiful. Love the tag with the pearls. Love the water colored dresses! Can't wait to get it and play! These are absolutely wonderful, Libby! You make me want to watercolor! Awesome cards and talent. The silhouette is my favorite. I love this kit and your cards are very sweet. You do a great job at water colouring! Oh my goodness!!! I'm in love for your glamorous creations!!! Love them so much!!! Your ballerina dresses are really adorable!!! This is one of my favorite kits ever! I love your cards and the kit!! wow from a card to a tag nice. love the kit. What great ideas, love your cards! Libby your backgrounds are gorgeous...so soft and elegant! Wonderful designs! Great cards, Libby! Can't wait to get my kit. Nice cards! Thanks for sharing! Beautiful cards! Thanks for the giveaway! These are all great, but I have to say, the tag is my favorite. Beautiful work. These cards are lovely and the tag is adorable, I love them all! Beautifully simple cards. 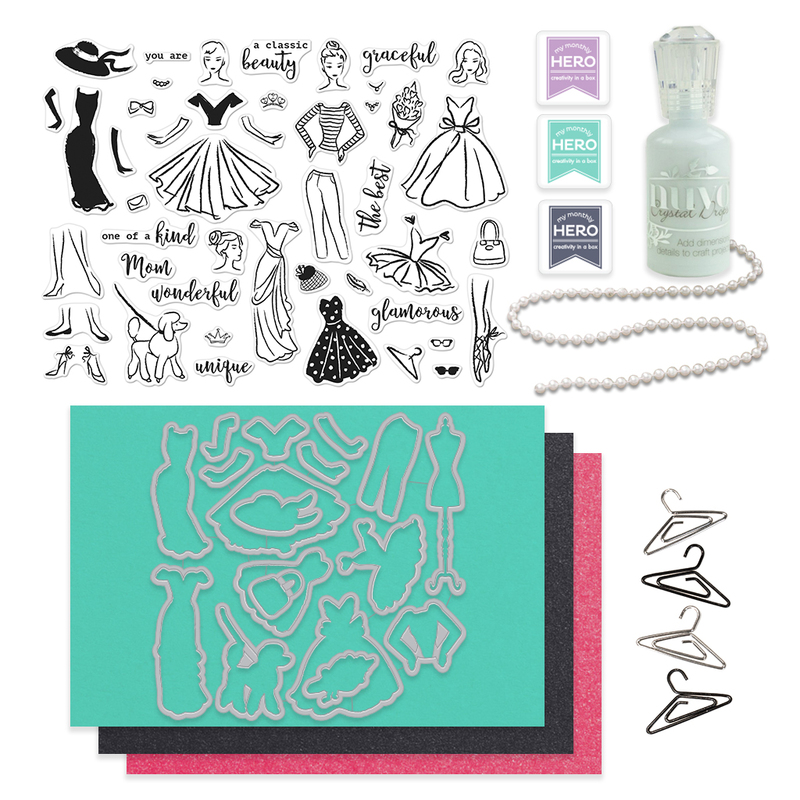 Your cards show that you don't have to have a million supplies to make an amazing piece of art. Am I glad I don't have to pick a favorite! The tutus are so cute and the elegant silhouette is just wonderful in the black with a pale pink background. Pearls on tags? Fantastic! Wonderful cards and tag with this kit. Your cards and tag are wonderful inspirations! Oh wow, gorgeous, that tag with strings of pearls is my favorite! So, so cute! It's kind of funny, I didn't even notice the sunglasses in the stamp set until your card... so cute and perfect for this time of year! Thanks for sharing your talent! I can't wait to get my kit! All of your cards are wonderful! The further into the blog hop I go the more I love this amazing kit! The possibilities are endless. You did such beautiful work with it. I absolutely love your tag - the layout, the colour, and the pearls finish it off perfectly! I love this kit and the cards you created. In fact, your designs on the Hero Arts website are what convinced me that it was a must have!! Such pretty cards - and I love the theme of this kit - so "girlie". Fun kit and love the unique tag you made. Pink dresses card is my favorite. Love all your beautiful cards! What a neat kit! thanks for sharing all of your beautiful cards! wish i had watercolouring skills like yours! I saw your ballerina dress card on Instagram and instantly fell in love. This is a great kit and you show it off well. Thanks for the chance to win. Great cards and the tag is gorgeous! A lot of great options with this kit. Beautiful cards and I love your tag! I am amazed by all of the possibilities with this kit! Thank you so much for the inspiration! Wonderful projects! This is such a fun stamp set! the tag looks so delicate and pretty! Your card designs are fun and classy. Really love the tag. So cute!!! The tag is my favorite! Awesome cards and tag! Love that sweet ballerina dress! Love it and want it all. Great Cards. Thanks for showing the versatility. 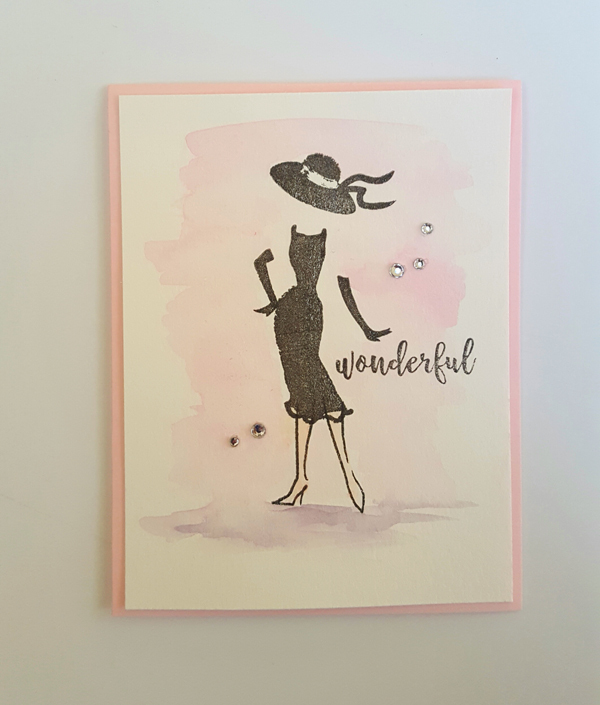 Love all your cards, especially the one with the silhouette on the soft watercolour background! I do love your style! Lots of beautiful ideas, thanks for sharing. Love the tag! Such lovely cards and great use of this kit. Great job on your cards and how you used the items from this kit! Love all your cards. Very creative. Wonderful new kit! Great cards, I especially love your Tutu card! very sweet feminine cards - what a wonderful set! These are beautiful! This kit lends itself to lots of B&W polka dots and stripes. beautiful layout. i can't wait to start with my kit. but of course i have to visit all the blogs for inspiration before diving in. Libby, how clever! Love the tag and the pearl string adds such a classy and elegant touch!! Oh my what gorgeous creations! Love the ballerina dress card!!!! Beautiful cards! I really love this kit and each card you created is so special! Thank you for sharing! It fits nicely with my image and it is wonderful! I want this kit very much! Love the watercolor and the string of pearls for the tag....very cute!